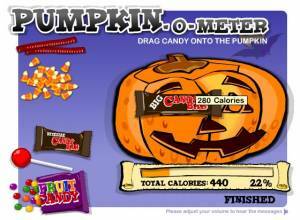 Pumpkin-O-Meter / Halloween Candy Game KidsHealth (U.S.A.), KidsHealth (U.S.A.), 2007 Play it Now ! Serious play to make children realize how many sugar contain the goodies. (The year of this game must be verified).